Sound familiar, doesn’t it? Fact is, there is a lot of difference between the two. Occupational therapy and physiotherapy do share a number of common areas. However, they differ fundamentally so far as their target and method of operation are concerned. Physiotherapy basically deals with evaluating and maintaining the physical functions in a human body. They deal with your injuries, bone and healthy functioning of other body parts. Occupational therapy is a bit different. It deals with physical aspects, but only so far as they affect your capacity to do something that is related to your occupation or well being. They help you in doing things that are either related to your work or things that are needed for your welfare. Physiotherapy deals with your muscles, bone and other physical aspects. They are not involved in the mental or emotional wellbeing of the patient. An occupational therapist is actively involved in the mental faculties of the patient. They work together with traumatized or mentally ill patients also. They work on issues like depression, stress and lack of motivation. The whole thing is targeted at making your experience on the job better. Occupational therapy focuses on understanding and improving the functional abilities of a person. 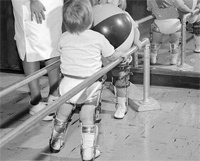 An occupational therapist is not concerned with the physical injuries of a person. Instead, he stresses on ensuring that the person can lead an optimal life, in spite of his injuries. He is not a person who generally prescribes medicines. Physical therapy, on the other hand, focuses on treating the person’s injury and also on preventing his injuries too. He will treat the tissues and muscles that are injured. He is a person with an extensive knowledge of both anatomy and other specialized areas like the musculoskeletal system. He is, in all probability, more knowledgeable about these injuries than your medical doctor. So, his methods of treatment may include exercises, massage and some amount of medicines. Both the fields are interesting and important in their own right. While one is important for the person to recover from injuries and malfunctions of the muscles and limbs, the other is important for overall well being of a person. 1. Physiotherapy deals with the muscles and limbs of a person. It helps in recovery and enables a person to move around. Occupational therapy deals with this and much more. It is all about a person making the best of his home as well as his occupation. 2. Physiotherapy does not involve anything about the mind. However, occupational therapy has a lot to do with the mental faculties of a person. 3. Occupational therapy helps a person in improving his functional abilities. Physical therapy focuses only on his physical abilities. 4. A physiotherapist may prescribe a few medicines. However, an occupational therapist generally doesn’t. Purpa Mukherjee. "Difference Between Occupational Therapy and Physiotherapy." DifferenceBetween.net. November 11, 2009 < http://www.differencebetween.net/science/health/difference-between-occupational-therapy-and-physiotherapy/ >. I am board certified in Chiropractic as well as Sports Chiropractic and Physiotherapy. I use the field of chiropractic to treat acute injuries and reduce down time, increasing the rate of return to play. This is accomplished by utilizing the philosophy that body alignment and joint biomechanics are the cornerstone for proper movement. Muscle strength and balance are an integral part of a healthy body. I also believe preventive healthcare can help you avoid injury, illness, and even manage stress. Body balance, nutrition, exercise and good spinal health can help improve your mental and physical well being. I specializes in non-surgical and non-pharmaceutical relief from headaches, sport injuries, neck pain and back pain. I understand that there can be a difference but not all doctors treatments or practices are the same and you can not bunch everyone into one category by their title. You should research each doctors practices and not use their title to decide if they are the right match for you. You have to make a decision by what treatments they actually use in their day to day practice to make the right decision. I want to know up to date information about difference between and/or comparison between Occupational therapy and Physiotherapy. Occupational therapy believes in healing the body and mind through the use of daily occupations. The word “occupation” in occupational therapy does not specifically refer to a persons job. That is a common misconception and it is upsetting that the author of this article did not reference adequate sources such as the American Occupational Therapy Association for an accurate description of OT. In response to the quote “An occupational therapist is not concerned with the physical injuries of a person,” the author could not be more wrong. An OT is highly concerned with the injuries and/or disability of their clients because it is how they form their treatment plans and know how to physically improve their clients’ functional mobility. In addition to this, certified occupational hand therapists know more about the anatomy of the hand than any other profession aside from a hand surgeon, a discipline they collaborate with frequently. Occupational therapy is a dicipline all its own. They are concerned with the psychosocial aspects as well as the physical well being of their clients. Using activities clients perform in their daily lives as a means and an end to therapy is just touching the surface of an OT’s role. They improve peoples lives overall, which may include their job, but that is certainly NOT the main focus of Occupational therapy as a profession. Your description of an O.T was far better than that of the author. I also picked up on the fact that an O.T is not concerned with the injuries of a client, thats like saying a doctor is not concerned with injuries of a patient. I am a second year O.T student at the moment and we are constantly researching injuries, disease, mental health to name a few. But I am gathering you are also an O.T and it takes passion to do a job like this. I dont believe it is for everyone but it is an extremely rewarding job. I couldn’t agree with you more. I am a 2nd year student and have worked in a physical and a mental health setting on placement. Physical and mental health are equally as important. We take pride in treating the individual and are very person centred. Also I would like to add we need to have a very good knowledge of both anatomy and other specialized areas like the musculoskeletal system. On my particular course, we had to pass an exam on Anatomy, biology psychology before we could proceed to year 2. I would just like to add I am an OT student, if that wasn’t clear. Hey Billy.. Can I get ur number. I am really confused about my career.